The Allegro 7104 Deluxe Elbow Pad offers strong support with its soft foam padding backing the abrasion-resistant flexible caps. 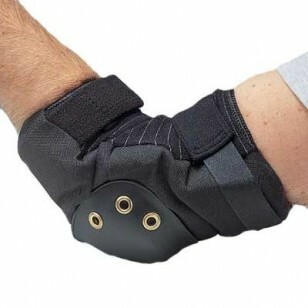 This elbow pad has fully adjustable Velcro closures and elastic sleeves that provide a comfortable, custom fit. The protective pad stands firm against harsh weather and water. The exterior shell is constructed from Nylon for longer wear and has an elastic sleeve. The interior shell is also constructed from Nylon and has a foam backing for comfort. Straps are 1 1/2" cotton reinforced elastic and feature easy to adjust Velcro closures. The inner pad features lightweight molded foam and is water resistant and has high tear strength. Sold in black and is one size fits all. Fully adjustable closures along with elastic sleeves provide comfortable, custom fit.